Welcome! You have entered the new site of The Order of Hope! We hope you enjoy your stay. » "Why, HELLO there, little ones!" Mutations: Antlers, Fangs, and the ability to leap tall buildings in a single bound! For those who don't know, allitertion is: The occurrence of the same letter or sound at the beginning of adjacent or closely connected words :and that's what this game's about! Basically you have to post a sentence with all the words starting with the same letter and the posts will order A-Z. Agitated ants attacked an angry Alfred after an absurd afternoon attending an amusing arcade. Barry's bumblebees buzzed brightly by bringing back biscuits. Darned dogs deposit dung during droughts. Location : Taking to the sky! 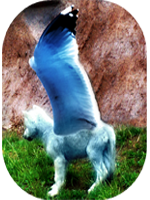 Mutations: Seagull wings, along with withers that have a mix of fur and down. Her fur is tinged blue. Eerie eels electrocuted enormous elephants elegantly. Gleeful gators galloped ghastly, gobbling green grass gobbling goats. Mutations: Wings, a golden pelt that can cast light and the ability to influence another's emotions and decisions. Interestingly, Isaac's icecream is imporant in Isabella's irritating, ignored ideas. Kammy's krabby kangaroos knock killer Ken's kazoos. Leaping Lego Lizards Lollygagged Lazily. Mary Margaret makes marvelous malted meatballs. Location : Places... many places. Otto's otters of old owned ocelots. Penny playfully placed pie, precisely putting pieces per person. Rabid rogues rob ravishing rafters. Squeaky squirrells speak silently sending Shakira silver shawls. Tittering tuna tell tall tales to teal teacups. Umber Umbrellas utter under unicorns. Vivacious vixen violate violet violins. When weasels widdle wands, wambats whine. Xiang xylophone XL x-ray xenon xerophytes x-rated Xmas Xeroxing xanthous xanthophylls xanthate.